During the adolescent years, acne is more than skin deep. The emotional effects of acne on a teenager can impact how they feel about themselves. Acne can result in low self-confidence, negative self image, anti-social behavior, depression and suicidal thoughts. The fragile self esteem of a teenager makes it difficult for them to put their best face forward when it is covered with “imperfections.” In addition to the myriad of negative implications arising from teenage acne, left untreated, acne can leave permanent scars. Acne is the most common skin disease in the U.S. 85-90% of the population between the ages of 12 and 25 will experience acne. Hormone levels, specifically the androgen related hormones, increase during puberty and stimulate the glands that produce sebum. As a result, these glands produce more sebum, which tends to clog the pores of the skin and entrap dead skin cells, supporting the growth of bacteria and initiating the acne cascade of pimple development. Where there is more sebum, there is a higher likelihood of comedones (white heads and blackheads) as well as the development of inflammatory acne pimples. Studies have shown that more recently puberty is beginning earlier than in the past. It is not uncommon for children to experience puberty as early as the age of 7. With the onset of puberty, acne can be expected to make an appearance. Most children begin puberty between the ages of 10-13 with girls developing acne around the age of 11 and boys around the age of 13. Boys produce 10 times the amount of androgen as girls and therefore tend to develop more severe cases of acne. There are many factors that contribute to acne. As a parent, some of these are easier than others to monitor and/or control. Stress: When the adrenal glands are stimulated, they produce more stress hormones, which can directly impact acne. Diet: Teens should avoid high glycemic index foods, which spike blood sugar levels. The body processes these very quickly which increases insulin levels and inflammatory reactions and may lead to breakouts. Dairy products contain hormones and can also be very problematic. Try to eliminate dairy in your child’s diet for a few weeks and see if there is a noticeable change. Dairy can be replaced with non-dairy items such as nut-milk, rice-milk and coconut-milk based products. Try to avoid soy as these products have other impacts on health. After a few weeks, slowly reintroduce dairy and see if there are noticeable changes in your child’s skin. Encourage your teen to wash their face twice a day with a mild cleanser that is non-comedogenic and oil-free. Teach them the basics about washing their face. Use warm water, your chosen cleanser and your hands. Wash gently, do not scrub vigorously as this can cause more damage to the skins surface. Avoid hair products and cosmetics that contain oil. When shopping for products for them, make sure they are oil-free and non-comedogenic. Encourage them not to pick at existing pimples or try to pop pimples since this will make it worse and elongate the healing time. Show them how to camouflage the area if necessary (see below). The less products they put on the area, the quicker the time to heal. Family history:If acne is in your family genes, this could be something that your child is predisposed to getting. Get plenty of sleep! Skin repairs itself during sleep so it is important to get plenty of sleep. Adequate hydration: Girls between the age of 14-18 should consume at least 8 cups of water per day and boys should consume at least 11 cups. Being consistent with their chosen routine, including cleansing and medication. Wash the face twice daily, morning and bedtime and again after sports. Follow the suggested guidelines for face washing. Guys should shave carefully over breakouts, using an electric razor, and shaving as little as possible. Due to the serious emotional side effects of acne, parents really need to play an active part in their teenager’s daily life. Most teens are more affected by their acne than they verbalize. Depression and/or anxiety related to acne can lead to long-term psychological effects. There are many ways that parents can steer their teen away from negative thoughts and damaging self-esteem issues. Encourage children to take care of themselves by eating healthy, getting ample rest and exercise. This will give your child a reason to feel good and ultimately help with their acne. Ensure that your teen sticks with their chosen acne treatment for at least 3 months (see below for recommendation) to see the results. This can be a long process for a teenager so help them remember to be patient. Hormone levels will continue to fluctuate for years, which can temporarily disturb treatment progress. Remind them to be patient and be their cheerleader. Encourage your teen to participate in activities they excel at and enjoy, taking the focus off their acne. The activity can be anything from a sport or other fun activity. Be mindful and listen when they talk to you about their feelings and/or insecurities. Look for ways to help them get through this difficult time. If your child is a girl, a trip to the makeup counter at the local mall for a lesson on makeup application can go a long way in improving feelings of negative self-image. Or take your son to his favorite store and get him something that will make him feel great. Keep your ears and eyes open for warning signs of depression and isolation. These should be taken seriously. Call your doctor immediately to discuss and determine a plan of action. If your teen feels the need to hide their acne, they can use a BB cream that matches their skin tone to conceal the area. Help them find a product that is oil-free and non-comedogenic. Boys can also use a concealer to hide acne. Remind them not to use too much product as this can make their acne worse. Encourage them only to use this when absolutely necessary. The more products and chemicals that they apply to their skin, the longer it may take for their skin to heal. 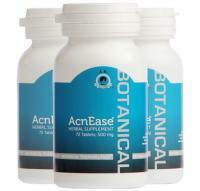 AcnEase® is an excellent resource for this troubling time for both you and your teen. Don’t take it from us, we can connect you with many Moms who have been in a similar situation, and whose teens have gotten rid of their acne from using our 100% all botanical acne treatment. Not only can AcnEase® treat current breakouts, it will prevent future ones from surfacing. This is why AcnEase® is unique – through prevention, it breaks the cycle of acne once and for all. By targeting and reducing the influence of hormones on sebaceous gland secretions, AcnEase® prevents the formation of future acne outbreaks. Hormonal teen acne occurs in astounding numbers, and anyone can be affected. By choosing AcnEase® for your teen, you eliminate and prevent acne at the source and don’t have to worry about the potential side effects of using prescriptions (or worse yet, off-label prescriptions). In addition to the myriad of side effects that can happen during the teenage years, acne can leave long term emotional scars as well as permanent physical scars. Instead of avoiding the mirror, their friends and social activities, they are able to put their best face forward and enjoy this memorable time in their life. If you have a teenager going through a difficult time with acne, how are you dealing with it? We would love to hear your comments below. We’ve worked closely with many Moms to help their teens overcome this difficult stage, so we welcome the opportunity to do the same with you and your child.